I am out of work at the moment. so my time goes to looking for a new job. One including maybe creating a cooking show, so cross fingers. 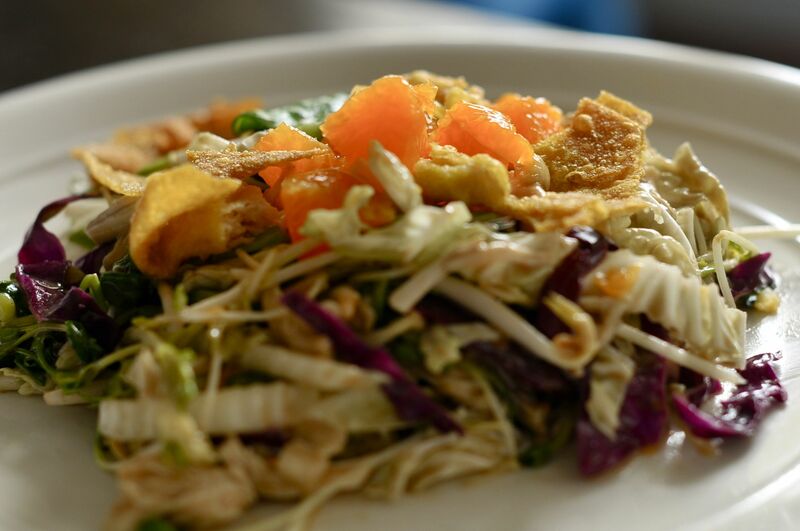 Today I share with you my oriental chicken salad, its fresh, crucnhy and filling. It works as a shared salad for a party, lunch or a dinner dish. There are different elements to this salad, you dont need all of it of course and you can make your own twist, but I found this combination leaves me utterly satisfied. I am not gonna give a specified amount, you cant choose how much or little you want to use. For the topping I used some finely chopped peanuts and some crispy wontons. You can use some broken up instant noodles instead of wontons if you have trouble finding wontons. 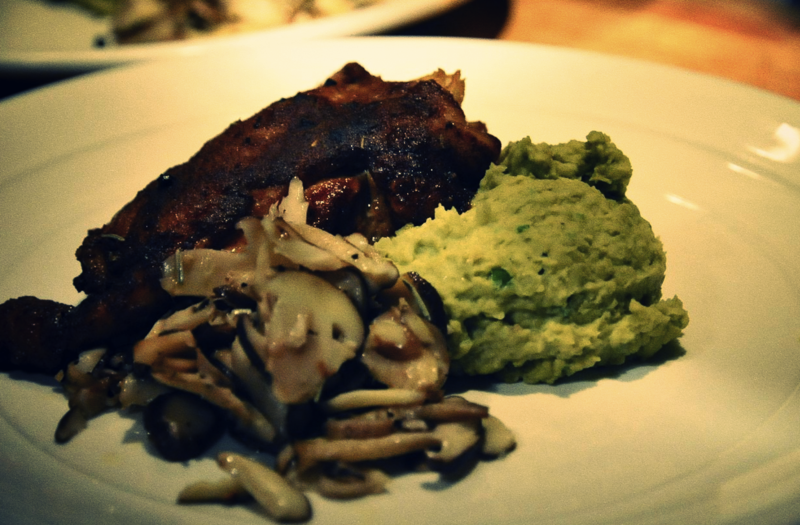 As for the Pea puree, I used canned peas, but whatever tickles your fancy, fresh or canned. It is a great substitute for potatoes, if you are trying to eat more low carb for dinner. Roast in oven at 200 degrees celsius for about 25 minutes, basting 3-4 times. When the peas come to a boil, leave for 30 sec. then drain peas. Transfer to a food processor and pour in the cream. Process til it become a silky texture. To keep warm I pour into a low heated pan then blend in the butter and keep it there till serving. I used some sliced mushrooms pan-fried in butter with salt and pepper, since I had in the fridge but purely optional. My favourite food is shellfish and any sort of crustaceans. I love mussels, oysters any seafood really that requires peeling out of a shell. 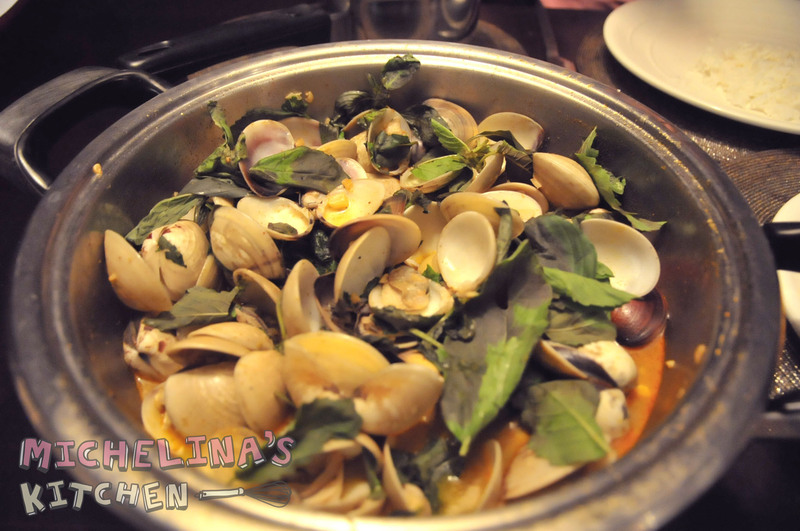 Clams is one of those delights that in Thailand is easy to come by and it doesn’t matter what Italian restaurant I am in, I always get the pasta vongole. This recipe requires Thai chilli paste (nam prik paw) it adds that sweet but spicy flavour that is such a staple of Thai cooking. It’s important that you keep stirring throughout cooking. chopped red chillies I use about 2, but this depends on how spicy you like. 1. Heat oil in a shallow frying pan then add chilli and garlic and stir fry for 30 seconds, be careful not to burn. 2. Add chilli paste stir well, then add the sugar and fish sauce, finish with the oyster sauce and stir. 3. Add the clams and stir well till shell opens up and slightly changes color (you can of course pre soak the clams to open up the shells a bit) Add some water. Keep stirring throughout. 4. Lastly stir in the basil leaves, remove from heat and give it a good last stir. I used to dislike couscous, it was just one of those foods I never gave a chance. 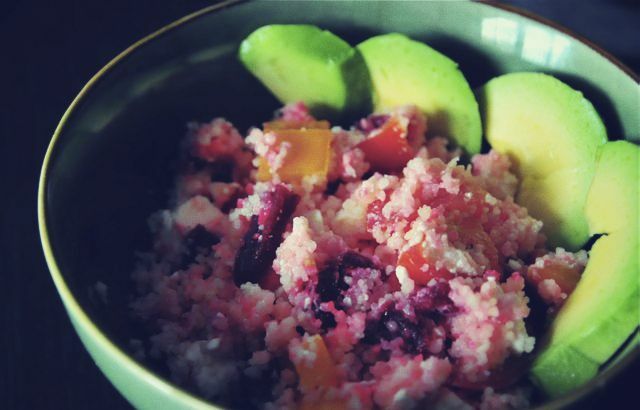 Then a few months back I was invited to dinner to some friends and they served me this couscous salad, I gave it a try and I loved it. Since then I have been hooked and you can always find this salad in my fridge. It’s great for lunch, pre or after workout meal as well as dinner side dish. This is great on its own with some avocado slices. Or great with grilled fish, chicken or meatballs. 3. In a separate bowl mix the yogurt, olive oil, mustard, salt, pepper and lemon juice. Pour mixture over the couscous. Mix well. Now I prefer this after its been in the fridge and let it set for an hour, but you can of course eat it straight away. 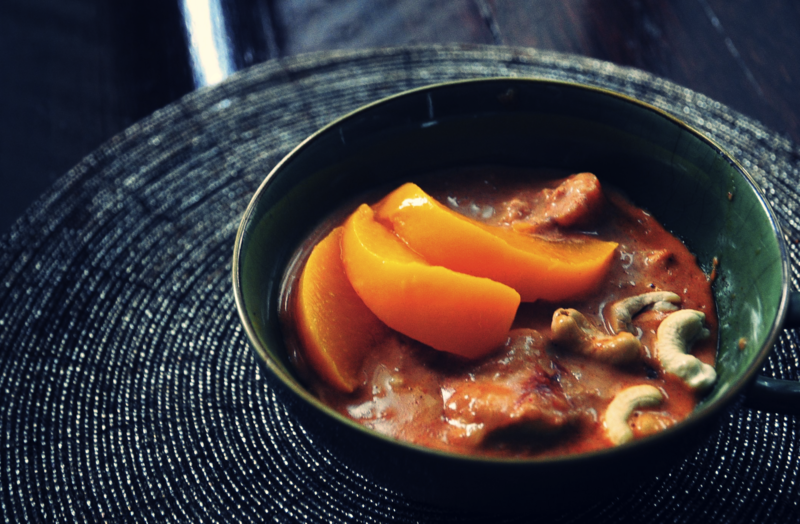 Peaches and chicken curry in mango chutney sauce. I´ve been getting so much heat for practically neglecting this blog. Its one of those things when you go through phases of no inspiration. I have been cooking, not so much new stuff. Also I don’t like how my pics turn out at night-time, just doesn’t look good. I just purchased a dutch oven, it cost a bit, but my my is it worth it. Have a feeling loads of my dishes will involve my new lovely red dutch oven. Today´s dish is a curry, I am not really sure what to call it. Just describing the ingredients might seem odd; Peaches, cheese, chilli, cream, cashews, chicken but the taste is wonderful. It has a very summery fresh taste, but also the comfort of a good curry. Now you don’t need a dutch oven for this of course, but I made it all on one pan. a pack of chicken filets, sliced up to cubes. In a cooking dish layer the chicken filets and peach wedges along till its filled. pour over the chutney curry mix, then sprinkle in the cashew nuts. Set in bottom of oven for about 30 minutes at 220 degrees celsius 420 fahrenheit. Enjoy with rice and nan bread. I know I have not been consistent with my recipe posting the last few months, but I have been cooking and taking pictures. I think my biggest challenge till this day is scheduling things in my life, to actually set time aside and sit down and do stuff and not surf in forums on the internet like I tend to do. 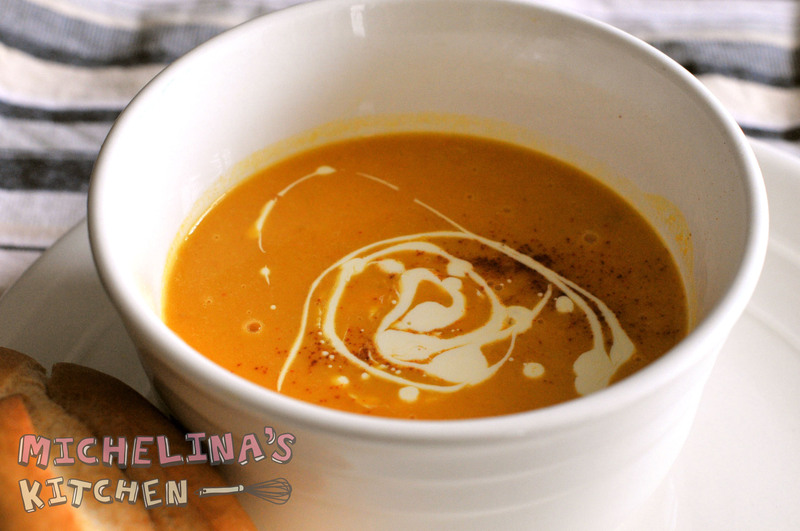 I had craving for some soup and my friend suggested pumpkin soup with Thai red curry and coconut milk instead of cream, this sounded like a sure winner to me. 1. Saute the onion, shallot and garlic in the butter for a minute before adding the stock. 3. In a separate saucepan heat some oil add the curry, let it simmer a few second before adding the coconut milk. Let it simmer for about 2 minutes. 4. Pour everything in a blender and pulse a few seconds, be careful as I had a full blender and steam came shooting up, so you might want to do it in 2 batches. 5. Return to soup pan and ready to serve.